Paula expressed concern about people who are cruel to animals as well as human beings. It is certainly true that cruel people are hard to stomach. One of the worst punishments we can give them is to not associate with them. If cruel people only have other cruel people for friends then they may be pressured into reform to move into better company. You took a step in the right direction by confronting people cruel to animals. If everyone did that, cruelty would soon diminish in the human race. Do you forgive these people? Forgiveness is really for our benefit and here is how I deal with cruel people. I just see them as people of limited consciousness that do not know any better. Do we forgive a cat for tantalizing a mouse before he eats it? No, there is nothing to forgive because that is just the way it is with a cat and if you want to keep your pet rat or bird safe you must keep them away from the cat. Having negative feelings toward the cruel person, the cat or any other living thing is a waste of energy. Instead do everything in your power to be harmless and spread harmlessness. Even though one should forgive all people that does not mean you have to associate with them or accept them into your life. Jesus forgave the Jews who crucified him yet he also chased them out of the temple in anger partially for their cruelty to animals. JJ: Interesting question. Man is indeed cruel to man, but the animals eating and hunting each other on the food chain is indeed a fierce thing. Something I think is even worse is the hunger and cold they have to go through during winter months in the wilderness. Animals have an advantage over humans for living in this hunting environment. If a human learns he is facing a threat then he worries about it all the time, but because of a difference in consciousness an animal only has fear when confronted with immediate danger (in normal circumstances anyway). Thus a deer that is in danger only one day a month will live 29 days in relative peace. A human in the same circumstance would be in edge all 30 days. This does not answer your question, but perhaps it will give you the understanding that in many ways the hunted animals live in greater peace than we do. Why does God allow such apparent cruelty in the food chain? Many people think that God can just snap His/Her/It’s fingers and make everything right if He wants to but such is not the case. The evolution through the food chain in this sphere is the only way God can figure out to evolve the higher lives in this dense sphere. Without this process you and I would not be here. There is no other way at present. I know we have heard in all the religions that God is all-powerful, but God has reflected Itself into unlimited lives of which you and I are one and each life must work out its best methods of survival and evolution. If there was another way, the reflections of God who create evolution would have explored it, but apparently the way things are in the animal kingdom is the best we have been able to engineer so far. 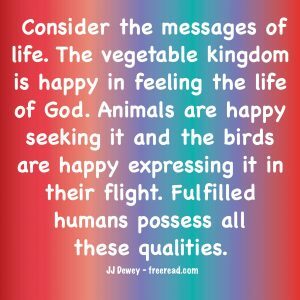 One thing that is helping the animals live more peaceably is that many humans have adopted them as pets and raised others for food and in doing so the domestic animals have become much more gentle than the wild animals, but also very dependent on us. “By your definition Hitler should be one of your greatest heroes for he was definitely “true to his own Self. He made his own decisions based on what he felt within,” just as you describe. I would like all four of you to answer this question for us. One of the problems is that we do not seem to be using any standard dictionary definition of words. Let me make a declaration for this list. From now on we use regular orthodox earthly definitions of words (unless otherwise specified) so we can maintain a semblance of communication. Red means red not esoteric blue. Up means up, not sideways in another dimension or standing still in an ultimate reality. Planet means planet, not dried out sun. Good and evil means something going on now as humanity understands it, not a vision from an ultimate reality that we no nothing about. Now Moe does not fit this dictionary definition and Hitler certainly does not and to maintain that Hitler is a hero either takes extreme sophistry or an attitude that is looking for strong argument and polarization in the dualities. Hitler was no hero for anyone centered on light and love.